Triangular Shipment – An introduction. 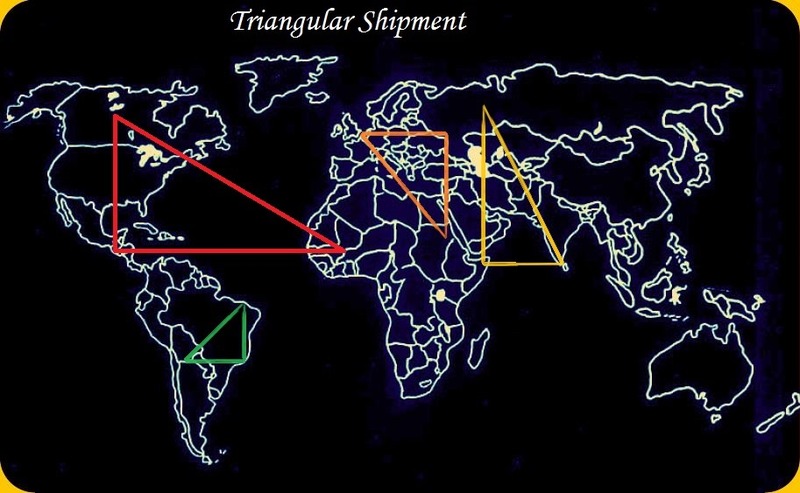 What is Triangular shipment? Who are the parties involved in a Triangular Shipment? How does triangular trade function? How many parties involved in a triangular trade minimum? How foreign exchange payments are accounted in Triangular business? There are different dimensions in the term ‘triangular shipment’. Here I am explaining about one of them. Let me explain Triangular Shipment with an example to make you easily understand. You are situated in Mumbai, India. You have obtained an order from a buyer called ABC from Yang Min, China. As per your contract with your buyer in China, you need to ship the goods to a party called XYZ New York, USA. Here, the purchase order from final buyer has been obtained by ABC from China and he procures goods from you in India. You will be shipping goods to the port of XYZ at New York. This is one of the examples of ‘triangular shipment’. I will explain once again to make easier on the above example of Triangular Shipment. As far as you are concerned, your buyer is ABC and you will receive foreign payment from your buyer ABC in China. All your accountability is with ABC only and you have no connection with XYZ. In turn, ABC will be receiving purchase order from XYZ. ABC receives amount of sale of goods also from XYZ. ‘Certificate of origin of goods under triangular shipment’ is obtained from the final manufacturer of goods, here in this case ‘you’ situated in India. 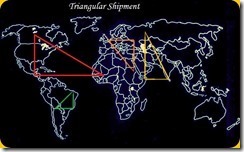 Do you wish to write more information about Triangular Shipment under international business? Share your experience about Triangular Shipment. Have you satisfied with this article about Triangular Shipment? Comment below your thoughts and discuss about Triangular Shipment in export and import trade. Hari nair: On 21 January 2014 Hi I have customer who is doing triangular shipments.He is based in Mumbai and importing from Switzerland to Dubai.Everyhting is fine and we issue switch B/Ls for him but he is requsting us to issue a COO from malasia.Is this possible?? as per my shipping knowledge COO can be issued only from the manufaturing country.Here in this case from Switzerland. Do we have any other option to tackle this issue Awaiting yours. Hari Nair. Gulmira: On 18 June 2015 I buy material from India and want my customer doesn t see manufacturer details. Can we make Switch Certificate of Origin? If yes what are the rules? Md.Anwarul Islam: On 02 July 2015 Hi!I have a situation where one country(main buyer) wants to buy and deliver to a 2nd country ( final receiving country).From 3rd country(main communicator between main buyer and main manufacturer/supplier) wishes to do the business,who will procure(import) the goods from 4th country(main supplier) and request for shipment(export the goods to the 2nd country as mentioned earlier).Do this type of business can work,how the B/L will be issued.Here 3rd country will act as an importer(import goods from 4th country) but the goods will not enter in his own country and get the B/L from the exporter and make payment to them.Again 3rd country will send a 2(two) sets of B/L, one to the main buyer(1st country) for payments and for final receiving country(2nd country) to take the delivery of the goods.Finally 3(three) sets of B/L will be required here.In this event main buyer will make payments 1st(after getting of B/L) and the main manufacturer/supplier will get payment within 45 days after actual date of shipment. aresh: On 16 July 2015 i would like to know can a Indian certificate of origin can be issued. for a cargo which i have bought from ABC CHINA and i am selling the cargo XYZ USA. cargo will not touch Indian port & will travel directly from China to USA. Usha Chandran : On 15 October 2015 I work in a department which deals with Import & Export Clearance. And your information regarding the import & Export on the website had helped me a lot in my Job, Thanks to you. I have a clarification on Importing of Maps. we have one of the Customer who had imported Maps and wants to clear the shipment. he is an individual. Please advice how to proceed with this. Do we need to get a No Objection from any Department. Please guide me. Harsh Jain : On 20 April 2016 I have a query , the answer of which I was unable to find. online. Q . Around 2% of my shipment has some defects for which the buyer is asking for a credit note or replacement.I'm willing to accommodate this request.Please guide me on the steps to be taken from my end for the same i.e documentation, customs, bank etc. Rameez Raja: On 10 August 2016 My name is Rameez Raja and I have been in a bit of a fix and was doing some research and happened to read your articles. I understand that you are a very learned man with great knowledge and may be You can give me a piece of advice So my situation is like this. I am based out of India, Delhi and have registered export company also but along with this I have started trading goods from China and shipping to Malaysia, Singapore. So the goods will be manufactured in China and shipped directly to the party. Ofcourse I am the vendor and the POs from the buyer are all issued in my company name. The problem and the big question is goods exported from China need FormE/Certificate of origin. Now can shipper details in Form E different from BL because I plan to make a switch BL. Rahul: On 10 August 2016 THIS IS RAHUL FROM CHENNAI. I AM INTERESTED IN PHARMA EXPORT BUSINESS. I GOT NO CLUES ON HOW TO GET EXPORT ORDER FROM COUNTRIES ARE THERE ANY DEDICATED SITE THAT PROVIDE PLATFORM FOR IMPORT EXPORT. SD EXPORTS IMPORTS : On 08 April 2017 Dear Team, I got an order at Maldives, but the goods are at China. China party ready to supply to Maldives, But Maldives buyer made purchase order on my Indian company name. Guide me at the earliest sir.